How did the United States' support of Mohammad Reza Shah Pahlavi ultimately change the relations between Iran and the United States? One of the most pivotal leaders of Iran, Mohammad Reza Shah Pahlavi, brought nationalism and reform to Iran. Under his leadership, Iran became a very wealthy country. However, his reign, marked by dictatorship and violence, ultimately ended in his exile. In 1919, Great Britain, through the Anglo-Iranian Oil Company, held a major interest in Iran. Britain reaped generous profits from this partnership and in return, provided Iran with military and political support. Gradually, as nationalist opposition to this partnership intensified throughout Iran, Britain supported Reza Khan, the Minister of Defense in Iran, a strong proponent of the Westernization and modernization of Iran. With the support of Britain, Reza Khan dethroned the Qajar dynasty in 1925 and crowned himself leader of Iran as Reza Shah Pahlavi. Throughout his leadership, Pahlavi had constant conflicts with Britain, usually due to the influence Britain had on Iran through the Anglo-Iranian Oil Company. Trying to rid himself of Britain's influence, Pahlavi developed alliances with the Soviet Union and Germany, mostly with the latter. In time, Germany accounted for over forty percent of Iran's trade. Iran enlisted many Germans as advisors, and so, at the outbreak of World War II, Reza Shah Pahlavi declared Iran to be a neutral country. When the Germans attacked Russia during the war, the allies suspected Pahlavi as collaborating with the Germans. Thus, in 1941, the Allies insisted Iran break its ties with Germany and remove the German advisors. After Pahlavi refused, Britain and the USSR invaded Iran on the pretext of securing a supply route to Russia. On September 16, 1941, after refusing to cooperate with Britain and the USSR, Reza Shah Pahlavi was forced to step down. His son, at 22 years of age, Mohammad Reza Shah Pahlavi, became the leader of Iran. After World War II, the United States and Britain withdrew, as promised, from Iran. The Soviet Union, however, remained. Desperate to relieve his country of the Soviet occupation, Mohammad Reza Shah Pahlavi (the shah) appealed to the United Nations for assistance. President Truman sent a letter to Stalin insisting that the Soviets withdraw or face American forces. At the time, the United States was the only country to have nuclear capabilities. Stalin withdrew his troops, and this solidified the alliance between Iran and the United States. There was still discontent in Iran due to British influence in Iran's oil industry. Muhammad Mosaddeq had become leader of a movement to expel Britain and nationalize the Iranian oil industry. 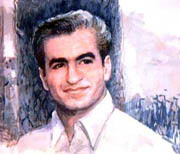 The shah appointed Mosaddeq as his Prime Minster on April 29, 1951, and in 1953, Mosaddeq successfully nationalized the oil industry. Iranian support for Mosaddeq grew, and demonstrations forced the shah into Roman exile during August of 1953. But, the United States, which perceived the shah as the only stable leader in the Middle East, developed a plan, using the CIA, to overthrow Mosaddeq. The shah returned after only one day of exile. In 1963, the Shah began the White Revolution, a renewed effort to Westernize and modernize Iran through land reform and women's suffrage. Partly due to the rapid decline of rural Iran, the chasm between the wealthy and the poor widened. The wealth being generated by Iran's oil industry was not equitably distributed among the Iranian people. The Shah faced continued opposition from the conservative religious clergy, who were strongly united against Westernizing Iran. The Ayatollah Khomeini became a leader in this opposition and was exiled by the shah. In 1973, due to growing discontent in Iran, the Sshah hunted down all secular opposition with his secret police, the Savak. During the rest of the 1970s, the Shah became more and more repressive. The year 1978 was marked by a series of demonstrations which ended in hundreds of people being murdered by the police. During December, the celebration of the month of martyrdom, thousands of demonstrators seized government buildings, shut down businesses and assassinated government officials. Thousands began calling for the death of the Shah. On January 16, 1979, the Shah fled the country. Days later, the Ayatollah Khomeini returned to become the leader of Iran. On November 4, 1979, Iranian revolutionists stormed the United State's Embassy and took fifty-three Americans hostage. Their demand was for the shah in return for the American hostages. The Shah died on July 27, 1980 in Egypt. The revolutionists released the American hostages on January 20, 1981. 26 October 1919, Mohammad Reza Shah Pahlavi was born in Tehran, Iran. His father Reza Khan, was the Minister of Defense in Iran. 1941, Even though Iran proclaimed neutrality during World War II, the USSR and Britain demanded Reza Shah Pahlavi get rid of his German advisors. He refused. Iran was invaded by Soviet and British forces. 16 September 1941, Reza Shah Pahlavi was forced to abdicate his crown. His son, Mohammad Reza Shah Pahlavi ascended to the throne in Iran. 1945, The United States and Britain withdrew from Iran. The Soviets remained. The United States assisted Mohammad Reza Shah Pahlavi in the removal of Soviet troops. 29 April 1951, Appointment of Muhammad Mosaddeq as Prime Minister of Iran. 1953, Mosaddeq nationalized the oil industry and expelled the British. Demonstrations in the street, in favor of Mosaddeq, forced Mohammad Reza Shah Pahlavi to flee to Rome. August 1953, The CIA and Britain follow through with their plan to terminate Mosaddeq's government. Mohammad Reza Shah Pahlavi was brought back one day after he left Iran. 1963, White Revolution reforms were launched in an effort to Westernize Iran. 1973, Mohammad Reza Shah Pahlavi attempted to remove all secular opposition utilizing his force of secret police, the Savak. The gap between the "haves" and the "have nots" widened. 1975, Mohammad Reza Shah Pahlavi announced an end to the two-party system. 9 January 1978, United State President Jimmy Carter visited Iran. This sparked a protest by Iranian students. The students demanded Ayatollah Khomeini be allowed to return to Iran. The police opened fire and killed 70 students. 18 February 1978, Iranians demonstrated to commemorate the dead students and to protest the government. Over 100 people were killed in Tabriz. 30 March 1978, Over 100 demonstrators were killed in Yazd while commemorating the dead students of Tabriz. 8 September 1978, Iranian troops fired on a Tehran demonstration and killed several hundred people. 9 September 1978, Mohammad Reza Shah Pahlavi declared martial law and imprisoned opposition leaders. September 1978, Iranian workers struck and began to cripple the nation. 2 December 1978, Muhurram, the celebration of the month of martyrdom, began. Demonstrators seized government buildings, shut down businesses, and assassinated government officials. 16 January 1979, With millions calling for his death, Pahlavi fled Iran. 1 February 1979, Ayatollah Khomeini returned to Iran. 4 November 1979, Revolutionary militants stormed the United States Embassy and took 53 hostages. They demanded the Shah in return for the American hostages. 27 July 1980, Mohammad Reza Shah Pahlavi died in Egypt at the age of 60. 20 January 1981, Hostage crisis ended with the return of the American hostages to the United States. There are quite a few web sites related to Mohammad Reza Shah Pahlavi. The most comprehensive overview of site which details the history of modern Iran. There are two fairly extensive documentaries of the Pahlavi dynasty online (The Last Shah of Iran and The Fall of the Shah) exists. And also check the wikipedia entry for Mohammad Reza Shah Pahlavi. The Pavlavi Dynasty II web site also has information on Iran under the rule of the Pahlavi family. There is information on the background of Iran prior to and during the Pahlavi dynasty (CIA World Factbook or the US Department of State background notes). There is also a biography on the shah. For a historical commentary regarding relations between Iran and the United States, you can also visit PBS Frontline The Shah and the West. For a comparison of the leadership under the shah and the ayatollah visit Mr. Dowling's virtual classroom. There are a number of books detailing the life of Mohammad Reza Shah Pahlavi and accounts of the Iranian experience during his rule. The following books serve as good references. Ryszard Kapuscinski, Shah of Shahs (London, 1994) helps the reader gain an understanding of what it was like to be Iranian during this turbulent time. Peter Avery, The Cambridge History of Iran : From Nadir Shah to the Islamic Republic (Cambridge, 1991) gives an account of the religious and cultural changes in Iran from 1722 to 1979. James A. Bill, Eagle and the Lion : The Tragedy of American Iranian Relations (New Haven, 1989) details the history of US and Iranian relations from the 1940's to 1970's. Mary Ann Heiss, Empire and Nationhood : The United States, Great Britain, and Iranian Oil, 1950-1954 (New York, 1997) is a very detailed account of the 1951 seizure of British oil holdings in Iran by prime minister Mohammad Mossadeq. Dilip Hiro, Iran Under the Ayatollahs (Routledge, 1985) explores nature and extent of power of clerics now governing Iran. This page is copyright © 2010, C.T. Evans and P. Maxson.